Facebook considering acquisition of drone manufacturer. The social network rolls out new ad structure. These stories, and more, in today's Morning Social Media Newsfeed. Facebook is in talks to acquire a drone manufacturer to help blanket parts of the world without Internet, according to TechCrunch. The acquisition of Titan Aerospace is valued at $60 million, an unnamed source “with access to information about the deal,” said. The Wall Street Journal/Digits Titan’s drones reportedly can remain in flight 12 miles high for up to five years, offering a potential solution for beaming broadband to areas that don’t have it. A Facebook spokesman declined to comment. ars technica According to TechCrunch’s source, Facebook wants the company primarily for its second-generation drone, the Solara 60 — a larger version of the aircraft that can carry a payload of up to 250 pounds up to altitudes between 60,000 and 70,000 feet. 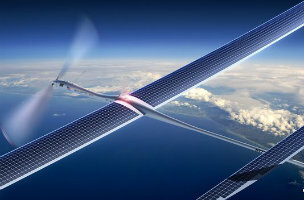 Facebook is reportedly looking for Titan to build 11,000 of the drones — enough to create an airborne communications relay system that could cover over 10 million square miles, roughly the size of Africa. TechCrunch Titan had previously raised an undisclosed amount of funding in seed, Series A, and A-1 rounds, and was planning to open a B round this year. However, the company was struggling to get investors to commit, TechCrunch learned from sources who had unauthorized access to internal information. The New York Times/Bits Blog Facebook would have to overcome lots of technical and legal problems before a global Facenet would be a reality. But the idea would allow the social network to one-up its rival, Google, which has its own far-fetched plan to extend the Internet to far-flung places via a network of balloons. Facebook began prepping brands on how to adapt to its new campaign structure, which it began rolling out Tuesday, offering a video detailing best practices, as well as an introduction and resources, in a post on its Facebook for Business page. The major change in the new campaign structure is the addition of a new level, ad sets, which will be placed between the two existing layers, campaigns and ads. Manalto is designed to mirror the internal structure of a business and enables multi-site, multi-brand organization from a single dashboard. With Manalto, a franchise organization could actually aggregate 500 Facebook pages and filter the pages by country, state, cluster or region. It looks like Yahoo is taking a page from Facebook’s advertising playbook. The Sunnyvale, Calif.-based company is testing ads on its mobile properties that prompt users to download apps onto their devices from third party developers. Samsung was an official sponsor of the Oscars, but the awards-show host decided to “organically incorporate the device into the selfie moment,” the company told TechCrunch. And Samsung returned the favor by offering to donate $1 for every retweet of the photo, for a total of $3 million, to charities of DeGeneres’ choice, St. Jude Children’s Research Hospital and half to the Humane Society of the United States. A social TV app we’ve reported on called TVInteract, used by TV news and entertainment shows to integrate social media on-air integration, has been acquired by hashtag aggregate Tagboard. TVInteract founder Jenni Hogan will move over to Tagboard as its chief media officer, heading up the company’s media strategy.